A Confederate letter written by “W(illiam) E. Isbell who on 5/1/1861 he mustered into "A" Co. VA 44th Infantry, then on 3/27/1862 he transferred into "A" Co. VA 20th Battn Heavy Artillery. He was POW 4/6/1865 Sandy Creek, VA., Confined 4/14/1865 Point Lookout, MD, took the Oath Allegiance 6/14/1865 Point Lookout, MD and released. The 2pp. 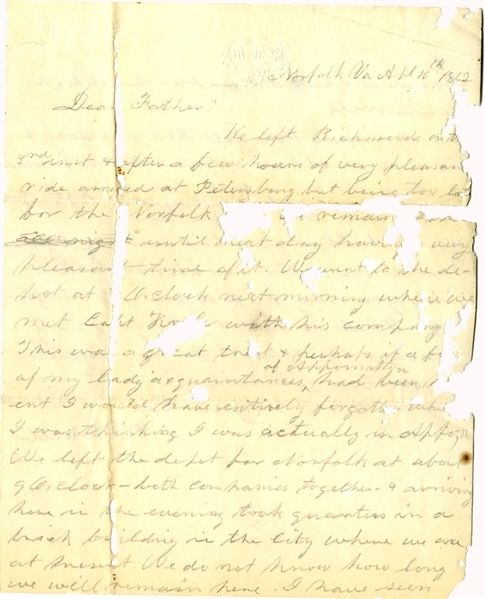 pencil letter, Norfolk, April 10, 1862 to his father has wormhole and fold damage cause the loss of several words, yet can be read. Isbell advises that the Merrimac has left the dry dock and is now anchored in the river ... ready to move at any time. he describes it a s a monster. Rare Confederate letter mentioning the ironclad.